Lovely to see that language is alive at the Washington State Ferries! How can one participate if one does not Tweet? 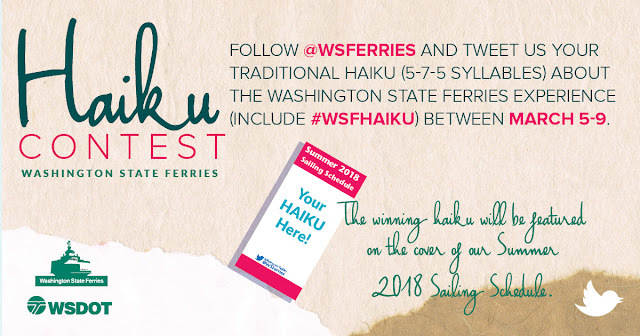 Because we are holding this contest as a way to increase awareness of our Twitter account – which provides real-time updates about ferry service – we are unfortunately only accepting submissions via Twitter. Twitter is free to sign up if you would like to participate. If you don’t want to create an account, another option is to have a friend with a Twitter account tweet us your submission. I don't twit. I wanted to submit an entry but i'm not willing to set up a twitter account. So, I'll just post it here.